I will be driving to Tyler and catching a flight to DFW and then on to Raleigh-Durham airport in NC. I will be preaching for my friend Pastor Charles Hamilton who pastors the GRACE INDEPENDENT BAPTIST CHURCH of Cedar Grove, NC. Not only will I be preaching on Sunday but I will be preaching Monday night at 7 pm. If you are in the area please come and be with us. We will have a great time! It is hard to believe that January has come and gone so quickly. I was going over my soul winner’s New Testament this morning praising God for He has given me 31 souls so far this month with 12 of those following the LORD in baptism. I am so glad that my path crossed with Dr. John R. Rice and Dr. Jack Hyles in 1972 at the GRACE BAPTIST CHURCH of South Bend, IN. The emphasis on personal soul winning was dramatic on my life. GOTTA LOVE THE OLD TIME RELIGION! I hope you will make plans to be with us in Milwaukee for the INDEPENDENT BAPTIST CONFERENCE. Dr. Shelton Smith, Dr. Russell Anderson, Dr. Paul Duckett Sr., Pastor Brent Lenetine, and Pastor Todd Poynter will be with us. Dr. Dean Noonan has done a marvelous job of building a soul winning church in the Milwaukee area as well as a beautiful new facility. 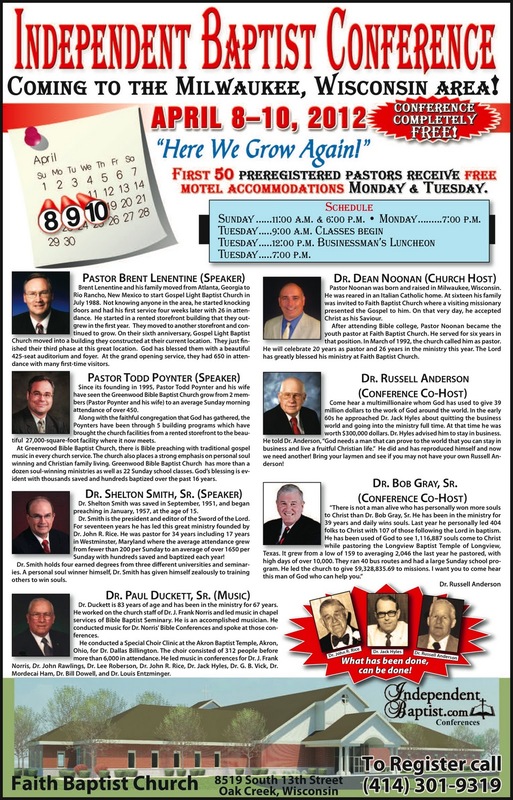 The first 50 pastors who call and pre-register for the conference will receive motel accommodations for Monday and Tuesday. Call 414-301-9319 NOW! There is no cost for the conference! Classes will begin at 9 am on Tuesday with Pastors and staff, laymen with Dr. Anderson, ladies with Mrs. Noonan, and youth with Youth Pastor Matt Kielas. There will be a luncheon for laymen, with everyone invited, hosted by Dr. Russell Anderson. He has the goods! He can help your laymen become effective business men and major contributors to your work. Behind every great revival in America was a great man of God. Behind every great man of God in that revival was a great layman of God. We must help our laymen of God as well as our men of God to prepare for a move of God. Dr. Anderson must not die without leaving the lessons he learned as a “coal miner” who made millions and gave millions for the cause of Christ. No one in history has given more than Dr. Russell Anderson. 39 million dollars given by him to independent Baptist works. Listen to this he gave 8.5 million in one day! YOU MUST BRING YOUR LAYMEN! SEE YOU IN APRIL!